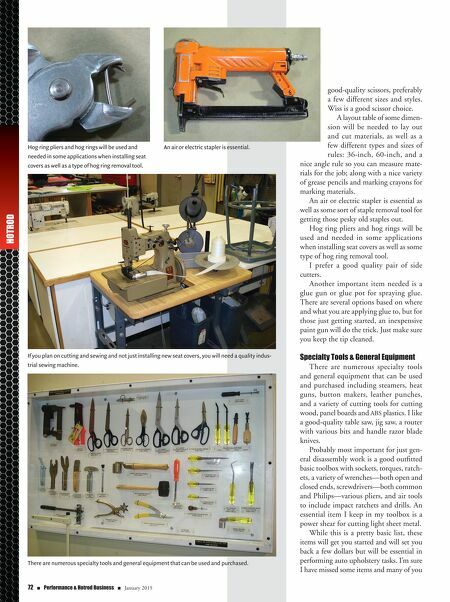 72 n Performance & Hotrod Business n January 2015 HOTROD good-quality scissors, preferably a few different sizes and styles. Wiss is a good scissor choice. A layout table of some dimen- sion will be needed to lay out and cut materials, as well as a few different types and sizes of rules: 36-inch, 60-inch, and a nice angle rule so you can measure mate- rials for the job; along with a nice variety of grease pencils and marking crayons for marking materials. An air or electric stapler is essential as well as some sort of staple removal tool for getting those pesky old staples out. Hog ring pliers and hog rings will be used and needed in some applications when installing seat covers as well as some type of hog ring removal tool. I prefer a good quality pair of side cutters. Another important item needed is a glue gun or glue pot for spraying glue. 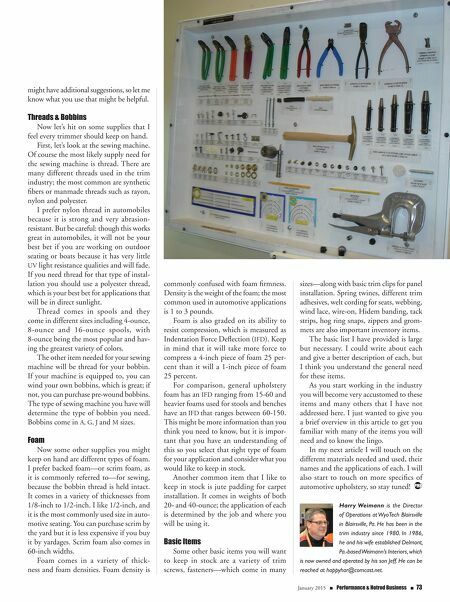 There are several options based on where and what you are applying glue to, but for those just getting started, an inexpensive paint gun will do the trick. Just make sure you keep the tip cleaned. Specialty Tools & General Equipment There are numerous specialty tools and general equipment that can be used and purchased including steamers, heat guns, button makers, leather punches, and a variety of cutting tools for cutting wood, panel boards and ABS plastics. I like a good-quality table saw, jig saw, a router with various bits and handle razor blade knives. Probably most important for just gen- eral disassembly work is a good outfitted basic toolbox with sockets, torques, ratch- ets, a variety of wrenches—both open and closed ends, screwdrivers—both common and Philips—various pliers, and air tools to include impact ratchets and drills. An essential item I keep in my toolbox is a power shear for cutting light sheet metal. While this is a pretty basic list, these items will get you started and will set you back a few dollars but will be essential in performing auto upholstery tasks. I'm sure I have missed some items and many of you Hog ring pliers and hog rings will be used and needed in some applications when installing seat covers as well as a type of hog ring removal tool. An air or electric stapler is essential. If you plan on cutting and sewing and not just installing new seat covers, you will need a quality indus- trial sewing machine. There are numerous specialty tools and general equipment that can be used and purchased.